I suppose it only makes sense that one of the most disturbing games in history managed to yield the most freakishly upsetting promotional material I have ever seen. 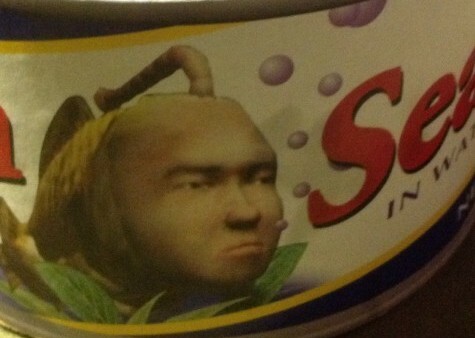 When Sega gave us the awesome nightmare fuel that is Seaman more than a decade ago, they apparently also saw fit to unleash a faux vacuum-packed can of humanoid fish-babies along with it. If that doesn’t sound like the setup for a Goosebumps book, I don’t know what does. Late last month, one lucky eBayer managed to rid him or herself of this accursed foodstuff, auctioning it off for an impressive $99. While I have to admit that I’d be tempted by any materials Seaman-related (har har har, laugh it up), I can’t imagine seeing this demonic cannibal feast staring back at me from any display shelf. Hell, even if this thing is just relabeled tuna, that means someone is holding on to thirteen-year-old tuna fish. Truly chilling. Would any of you guys pony up a crisp Benjamin to get your hands on Goosebumps #1999: Curse of the Seaman? $20 bucks sober, as high as $50-60 if I was super drunk. That’d be a really rad lil DC trinket to have.